It seems India read a lot. In top eight cities of India, every second shipment delivered is a book. The category of 'books' has maximum share with average 56% of the total deliveries made in country in 2014. According to Infibeam's report 'Infi E-trend 2014', on consumer behaviour and demand, reveals that in nine big cites of India - Ahmedabad, Bengaluru, Chennai, Delhi, Gurgaon, Hyderabad, Kolkata, Mumbai and Pune - books dominate in e-tail sales. In many of the cities, share of books in the total sale is more than two third. Book is a category that does not require warranty or guarantee and nor after sale services. Hence, the consumer across country prefers buying books online compared with other e-tail categories. Guaranteed higher discounts on books, especially the one like autobiography of Sachin Tendulkar 'Playing It My Way', 'I am Malala' and many others have pushed the sales. Both, the fiction and the non-fiction have almost equal share of the total online sale of the books. After books, 'computer accessories' have slightly higher share than the category of 'mobiles and tablets'. The average sale of computer accessories is little over than 9% and latter has 8%. Mobile and tablets, which contribute over 50% to the total sales value, stands at third position in sales (volume) in 2014. Interestingly, all kind of accessories, including one for computers, mobile and auto mobile have share of about 20% to the total e-tail sales. The fourth largest category, portable electronics, contributes up to 5%. Auto mobile accessories, home appliances, kitchenware, home furnishing and apparels, together have share of less than 15%. But among these categories, apparels is believed to be the fastest growing category, that too in double digit. The vibrant city of India, Ahmedabad is odd one out compared to other top cities of Gujarat. Reading tops the chart, but share of books in total number of deliveries is 46%. 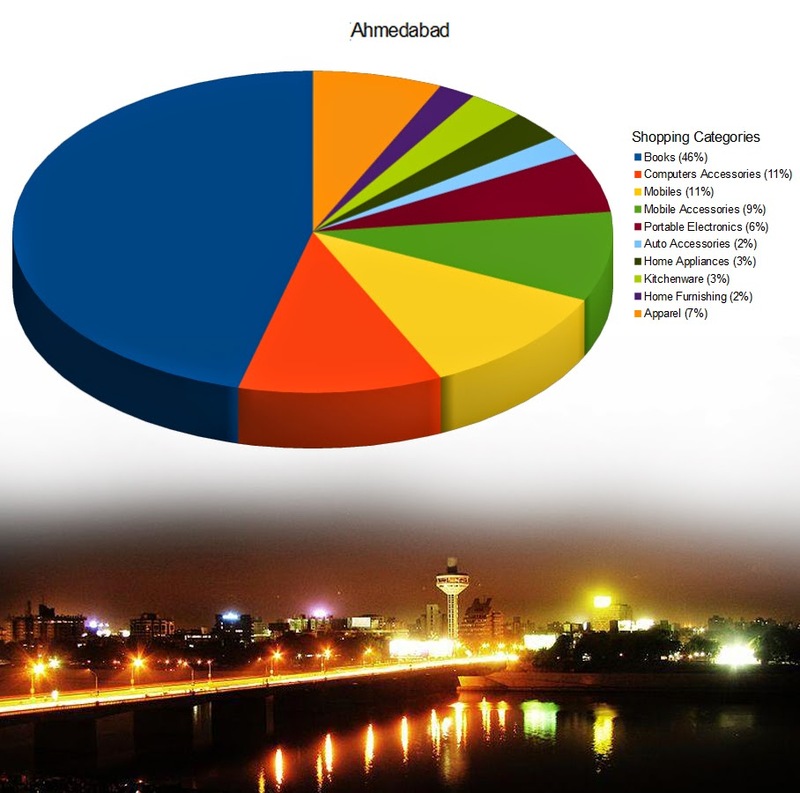 In mega city of Gujarat, Ahmedabad, mobile and mobile accessories hold about 20% followed by computer accessories with 11%. The erstwhile Manchester of East, the category of apparels has higher share in Ahmedabad compared to other cities of country. Kitchenware and apparels hold about 10% share in total number of deliveries. 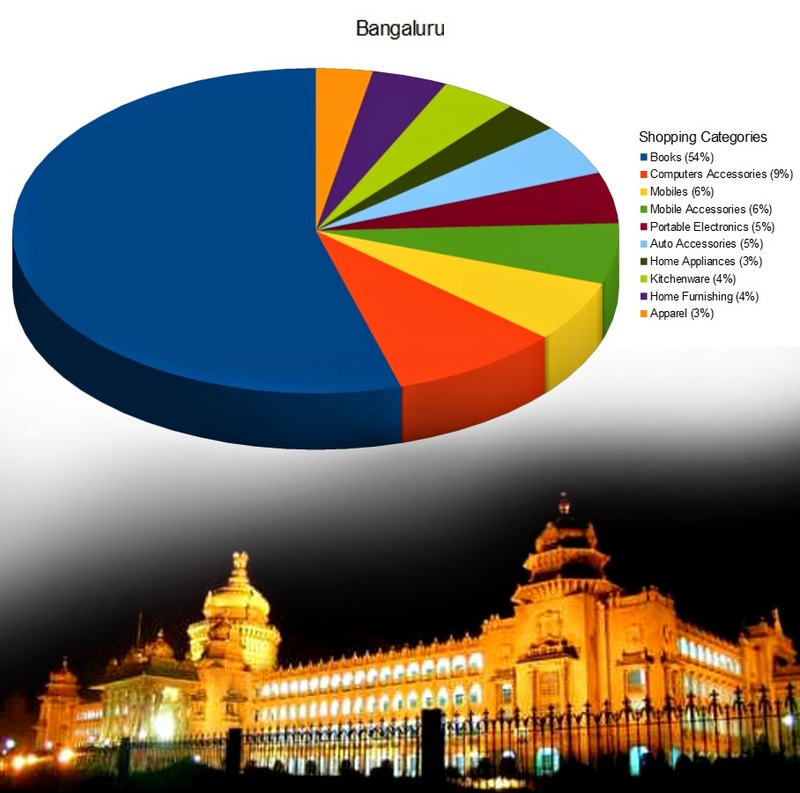 Like national trend, the category 'books' continues to dominate in e-tail space in the IT city of India, Bengaluru. 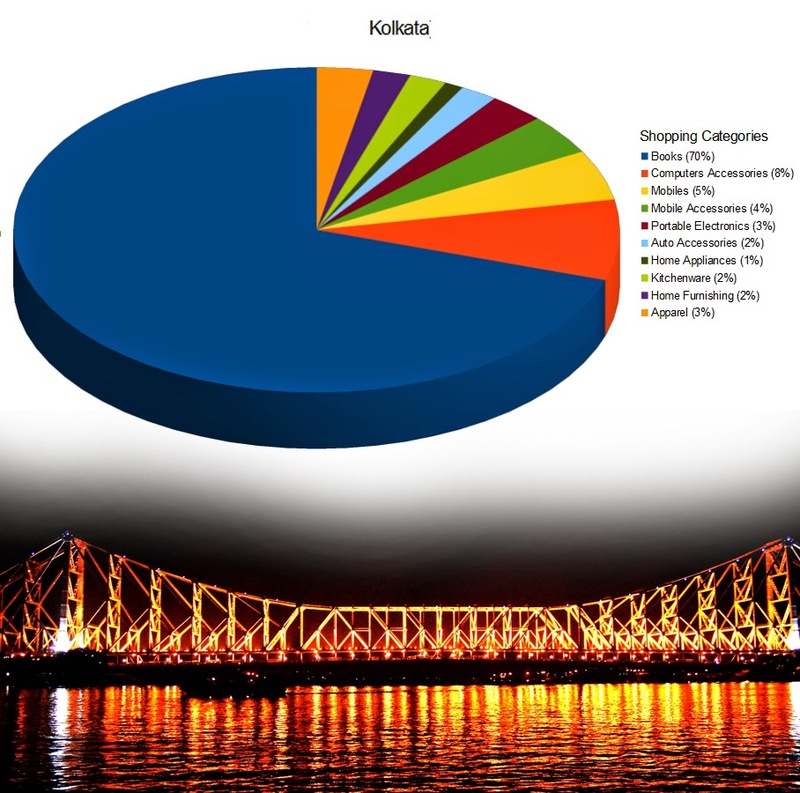 Of the total shipments delivered in the city, 54% is contributed by books. The category of 'mobile & tabs' and 'mobile accessories' together have share of 12%, followed by 'computer accessories', which has 9%. Portable electronics and auto mobile accessories, each, has contributed 5% to the total online sales in Bengaluru. 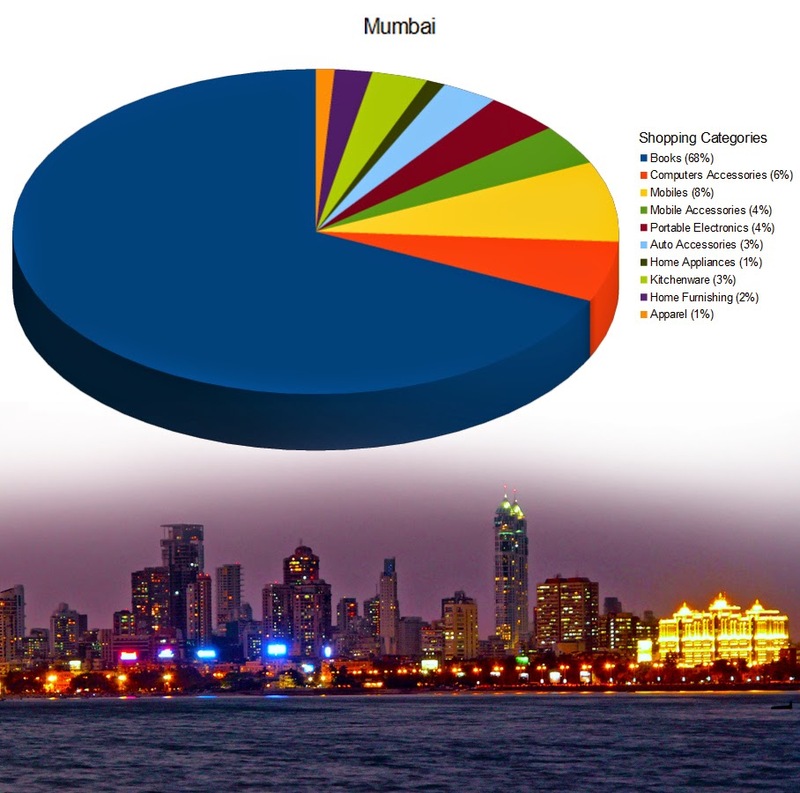 While home furnishing, home appliances and kitchenware, together eat pie of 11% in the city. Apparel has share of 3%. The metro city of Southern India, Chennai too has seen that every second e-commerce buyer loves to read books. Here, the demand for mobile or its accessories does not fall in top four. But, computer accessories is second followed by home appliances and home furnishing. 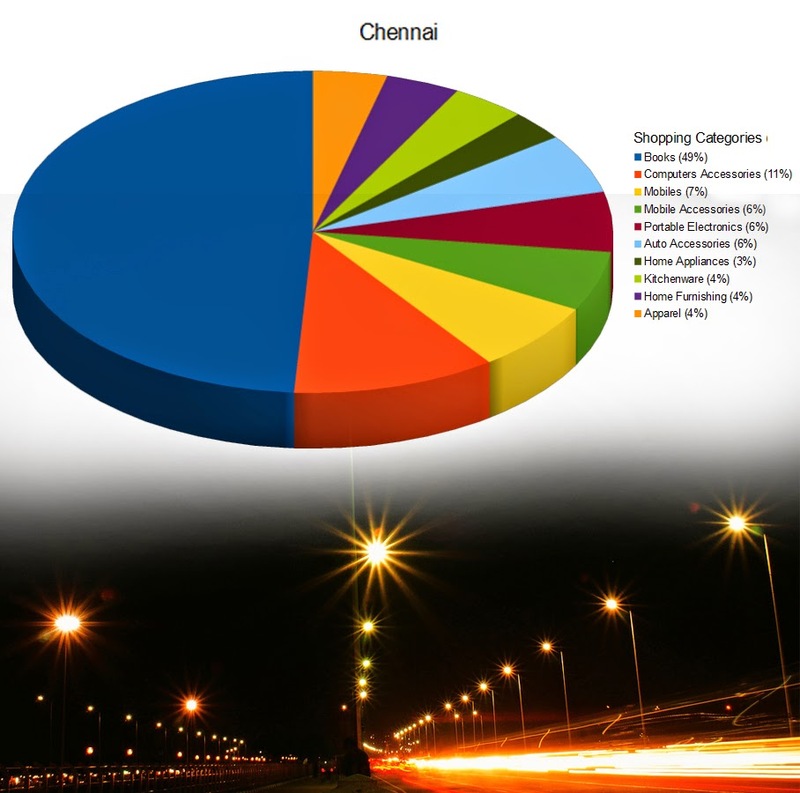 Compared to other top cities of India, the share of auto accessories in Chennai is higher. 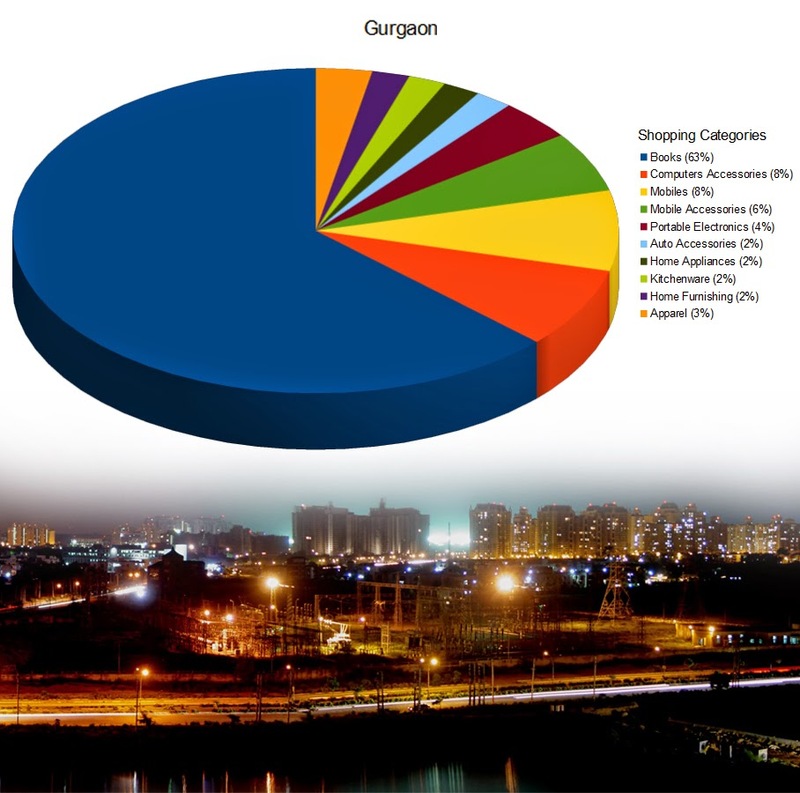 Part of National Capital Region, Gurgaon has somewhat similar e-commerce trends of Delhi. About one third of e-commerce buyers in city prefer buying books online. Books have 63% share in total number of deliveries, followed by mobile and mobile accessories with 14%. The computer accessories has 8% share while apparels and Kitchenware hold 5% share. 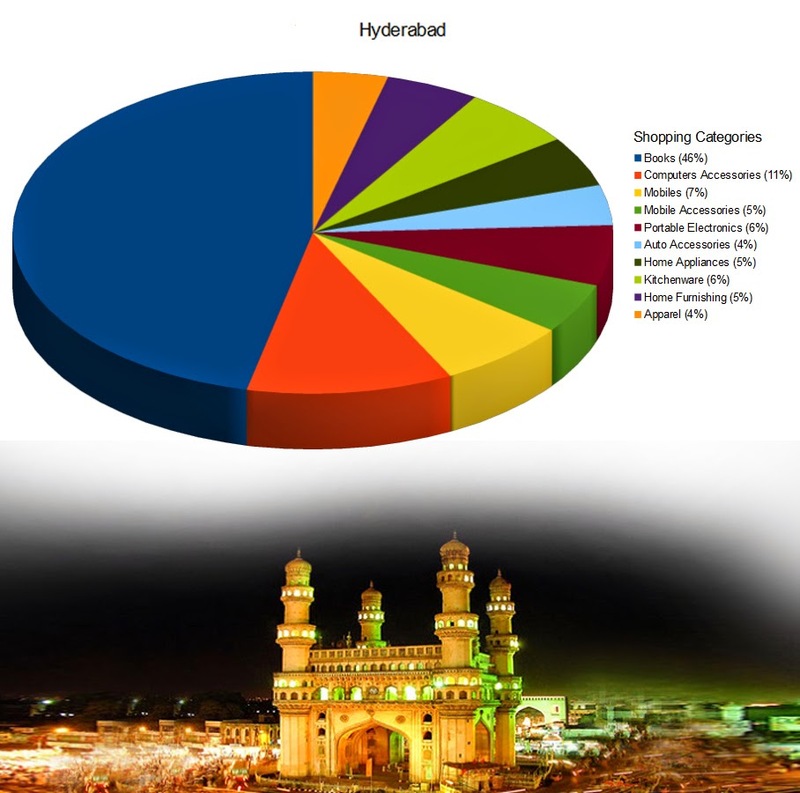 Famous for Charminar and also known as Cyberabad, Hyderabad has seen higher demand for computer accessories after books on top. Like other cities, readers top the chart in Hyedrabad too. Here, the number of deliveries of kitchenware and home appliances is higher than mobiles and tabs. The share of number of mobile accessories sold in Hyderabad is comparatively less than other cities. No one can beat the largest city of eastern part of India, Kolkata, in reading books. About 70% of the total number of deliveries in the city is contributed by books. This share is largest compared to all top cities of country. Rest all categories fall in remaining 30%. In the rest, mobile and mobile accessories have 9% followed by computer accessories is 8% and apparel&home furnishing has 5%. The financial capital of country has witnessed books contributing over two third to its total online sale. With share of 68%, books dominate the number of deliveries done through online sale at Infibeam, discloses 'Infi E-trend 2014'. Here, mobiles and tabs are the second largest category with share of 8%, however, value-wise mobile still dominates as the price per item ranges very high. Computer accessories is third largest followed by mobile accessories, portable electronics, auto mobile accessories, kitchenware, home furnishing, home appliances and apparels. People of national capital, Delhi, are always struggling with either extreme cold in winters or extreme hot in summers. But their top choice is books. Of the every three e-commerce buyers, two order books. About 65% of total sales in Delhi is with books. Followed by mobile and mobile accessories with 13%. 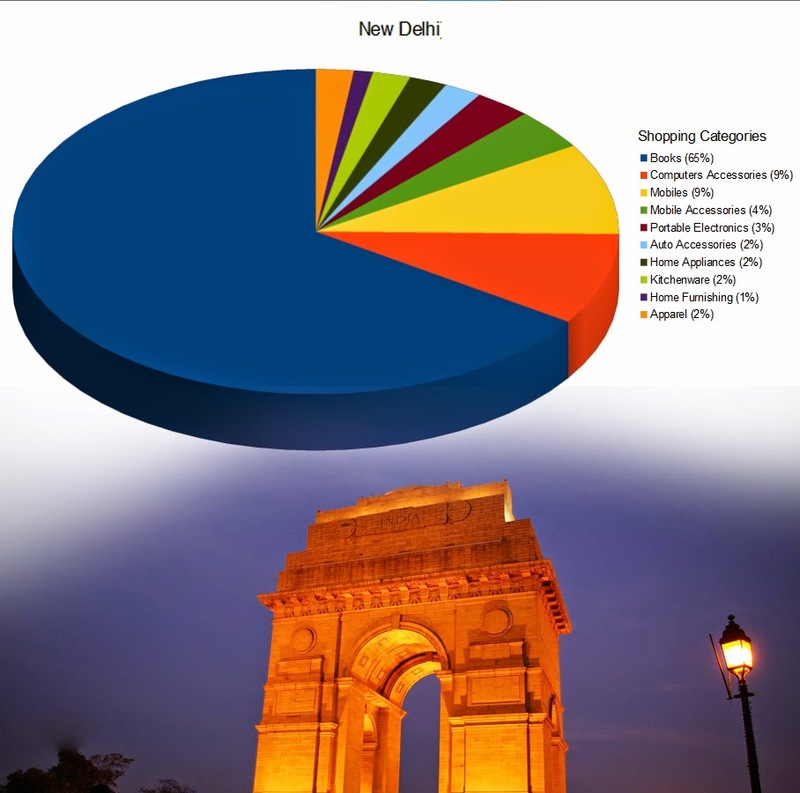 The home appliances, Kitchenware and home furnishing categories have considerable demand in Delhi while computer accessories has higher share with 9%. 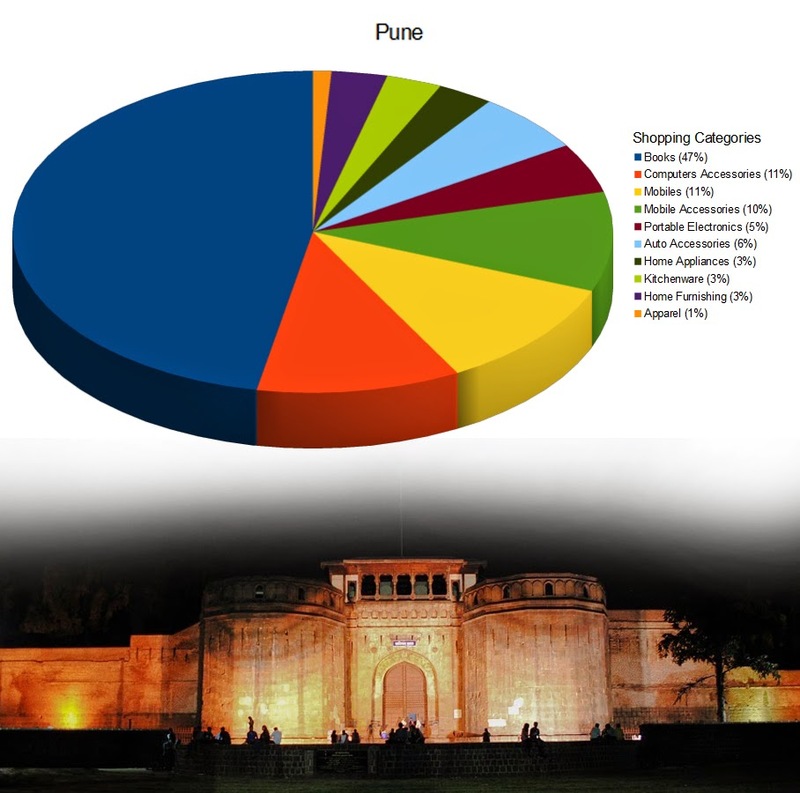 In one of the IT cities of western India, Pune, books too have little less than 50%. It can be said that almost every second person is ordering book online. And, mobile & mobile accessories are the second largest category delivered in the city. Here, computer accessories is on third position with 11% share while home appliances, home furnishing & Kitchenware have 9% share.